On December 8, 1854, Pope Pius IX proclaimed the dogma of the Immaculate Conception in the apostolic constitution Ineffabilis Deus. A little more than three years later, on February 11, 1858, a young lady appeared to Bernadette Soubirous. This began a series of visions. 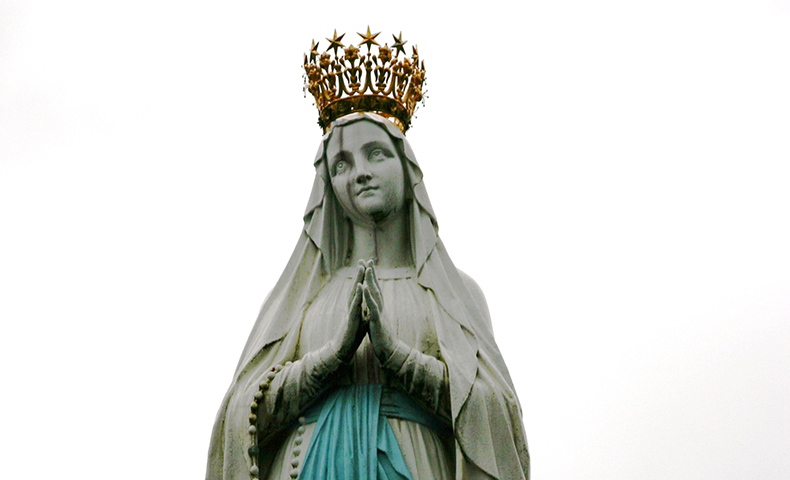 During the apparition on March 25, the lady identified herself with the words: "I am the Immaculate Conception." Bernadette was a sickly child of poor parents. Their practice of the Catholic faith was scarcely more than lukewarm. Bernadette could pray the Our Father, the Hail Mary and the Creed. She also knew the prayer of the Miraculous Medal: "O Mary conceived without sin." During interrogations Bernadette gave an account of what she saw. It was "something white in the shape of a girl." She used the word aquero, a dialect term meaning "this thing." It was "a pretty young girl with a rosary over her arm.â€� Her white robe was encircled by a blue girdle. She wore a white veil. There was a yellow rose on each foot. A rosary was in her hand. Bernadette was also impressed by the fact that the lady did not use the informal form of address (tu), but the polite form (vous). The humble virgin appeared to a humble girl and treated her with dignity. Lourdes has become a place of pilgrimage and healing, but even more of faith. Church authorities have recognized over 60 miraculous cures, although there have probably been many more. To people of faith this is not surprising. It is a continuation of Jesus' healing miraclesâ€”now performed at the intercession of his mother. Some would say that the greater miracles are hidden. Many who visit Lourdes return home with renewed faith and a readiness to serve God in their needy brothers and sisters. There still may be people who doubt the apparitions of Lourdes. Perhaps the best that can be said to them are the words that introduce the film The Song of Bernadette: "For those who believe in God, no explanation is necessary. For those who do not believe, no explanation is possible."